LOCATED in the middle of the Ningxia Plain, Yinchuan is the capital of Ningxia Hui Autonomous Region. Near Helan Mountains to the west, and with the Yellow River passing through the city, a land dotted with lakes and marshes formed since ancient times. Throughout its history, Yinchuan was an important city along the ancient Silk Road, the capital of the Western Xia regime (1038-1227), and an important city in northwest China. The grassland nomadic culture from the north, the cultivation culture from the Central Plains, and the commercial culture from the Western Regions all intersected and fused there to form a culture which is vibrant and diverse. Ningxia is located in the transition zone between the Loess Plateau and the Inner Mongolia Plateau. Thanks to the Yellow River, the Ningxia Plain has become a place where water bodies such as rivers and lakes can be found in what is otherwise a generally arid region. The Helan Mountains to the west weaken the eastward movement of high-altitude airflow from the northwest, curb the desertification from Tengger Desert, and act as a natural barrier on the Ningxia Plain. Western Xia Imperial Tombs have been almost completely ravaged by time and events, leaving behind only some stupa-like mounds to witness the tides of time. About 28 kilometers east to Yinchuan City is the ancient ferry on the Yellow River, namely, Hengchenggudu, which was once the most important ferry crossing between the Western Xia regime and the eastern part of the Yellow River. In 1697, Emperor Kangxi of the Qing Dynasty led his expeditionary force to cross there in the bitter cold winter to put down the rebellion of the Junggar tribe. They stayed at Yinchuan for 19 days. When they left, they also crossed the Yellow River from the ferry, leaving behind a memorable site. There is an ancient means of transportation – sheepskin raft, which is unique to the region as a means of transportation to cross the river in the upper reaches of the Yellow River. It has a history of more than 2,000 years. 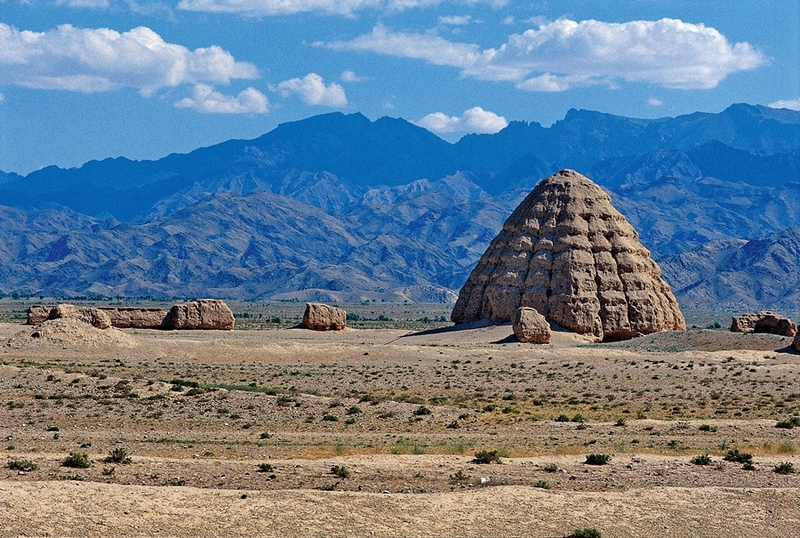 Ancient Ningxia was a region where groups of nomads and peasents met and traded. 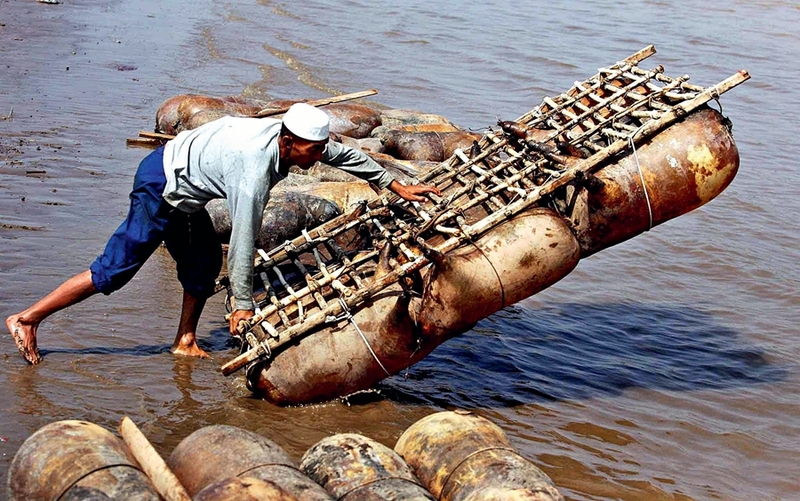 The locals gather materials on the spot to make sheepskin raft for water transportation. The load capacity of a sheepskin raft is about one ton, approximately equal to the weight of six to eight people. Every raft is made of 48 thin-wooden poles tied into a rectangular wooden frame, with about 14 inflated goatskins fastened below. Because the sheepskin raft has no power, it can only flow down along the river and cannot go upstream. On the return trip, it is light and flexible enough to be carried back. The sheepskin raft is a unique, indigenous means of transportation to cross the river in the upper reaches of the Yellow River. The raft is not only a unique means of transportation on the Yellow River, but also a folk art. Because of a series of steps involved, such as killing the sheep, shedding, fermenting, boiling the skin, and molding, it takes about a month to complete a raft. The sheepskin is processed and stored at a special temperature to ensure it is ready for the next step. After the wool has been removed, the openings in the neck and hoof are tightened one by one, leaving only one opening in to which salt and water are poured in. After leaving it to dry out in the sun, linseed oil is poured into from the opening in order to seal off pores to prevent leakage. At the last stage it is hung and allowed to dry. After it becomes yellow and transparent, it is taken as a sign that it has become airtight, flexible, and protected from cracks, anticorrosive, and waterproof. With advancements in technology and economic progress, power boats now do most of the heavy lifting with sheepskin rafts now being used mostly as tourist attractions. Yinchuan was once the capital of the Western Xia regime. As a feudal dynasty from 1038 to 1227, its rise and fall has left many questions unanswered for historians. Local cuisine being prepared consisting of stewed mutton in a large iron pot with a diameter of 1.5 meters. In 1038, Li Yuanhao established the Western Xia regime with himself as the self-styled emperor. As an independent kingdom ruled by Dangxiang people, it had its own language and character, enacted laws and regulations, issued currency, and was eventually defeated by Mongolians in their invasion in 1227. With the invasion of the Mongolian force, a large number of the classics of the Western Xia regime have disappeared, leaving few detailed records in existing historical books. The Dangxiang people lost their communal living areas and were gradually assimilated by the ethnic groups around them. Their ethnic language has also been lost and become indecipherable. Western Xia Imperial Tombs are located about 40 kilometers west to Yinchuan, which also happen to be the only remaining relics of this mysterious empire. The scenic area is among the most interesting imperial mausoleums in China. There are nine emperors’ tombs and 140 subordinate tombs of various shapes and sizes. Its construction scale is comparable to that of the Ming Tombs in Beijing. Influenced by Buddhism and the central plains culture, it organically combined with the Dangxiang culture to form its own unique form. After Mongolian forces sacked the Western Xia regime, they ruined the mausoleums as well. The surface structures were almost destroyed completely, leaving only some stupa-like mounds to witness the change of history. The terrain of the mausoleums is flat, and criss-crossed by gullies washed out by flash floods, where fine jujube trees now grow. The crown of the trees is not large with dense and thick leaves. They are like green ribbons, intertwined across the 53-square-kilometer mausoleum. What is amazing is that no gully passes through the imperial cemetery. In the past 800 years, there have been countless outbreaks of flash floods around the Helan Mountains. However, only the mausoleums were left untouched by flash floods. The reason remains a mystery for tourists and historians to ponder over to this day. In Ningxia, Hui cultural characteristics are reflected in all aspects of life. The unique style of the mosques, the restaurants, and the snack bars with “halal” signs, all display a strong synthesis of Hui and Islamic culture. The Hui people are a new ethnic group formed by the integration of the people from central China with the foreign merchants from Persia, Arabian and Central Asian countries after the 13th century. Western vegetables such as carrots, garlic, and onions were introduced to China through them. At present, there are 1.9 million Hui people in Ningxia, which is the densest region across China of the ethnic people, accounting for one-third of its whole population. As a very distinctive ethnic group, the Hui people are health-conscious, especially strict on dietary hygiene. On entering a halal restaurant, the windows are clean, the tables, chairs and tableware are neat and tidy, which always gives customers a good feeling. Hui cuisine enjoys a long history. As early as the middle of the 7th century, Muslim merchants from the Arabian and Persian regions came to Chang’an (now Xi’an) over land on business. They also brought their cuisine. Some of these people stayed in Ningxia for good, becoming the earliest Hui ancestors. They kept their original diet and lifestyle. After years of development, they have become heirs to a Hui dietary system with a wide variety, exquisite techniques, and special flavor. 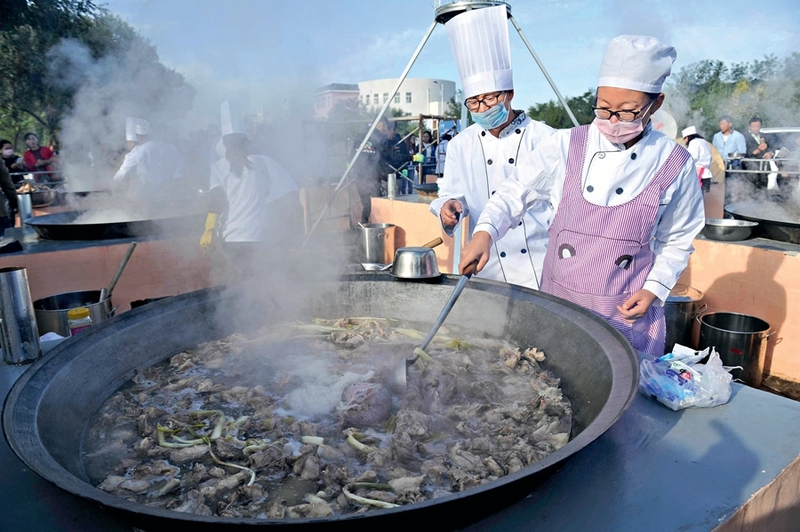 The most popular food in Ningxia is mutton. Locals eat mutton almost every day. There is a famous sheep in the area called Tan Sheep. It is a variety that has been improved by interbreeding with Mongolian sheep. It is one of the famous local specialties. Each sheep can also offer 3 to 5 kilograms of tender and delicious meat, which are very popular among consumers. The Hui people are very hospitable. The men at home usually receive guests, while the women boil water and cook tea. The guests are seated from the eldest to the youngest. The host will serve the guests a cup of warm Babao covered tea, youxiang (salt fried cake) and sanzi (fried dough twist), and guests chat while eating and drinking. In Ningxia, youxiang and sanzi are daily snacks for every household. They are seen at any place where Hui people reside. Every festival and holiday, people celebrate with the dishes. The preparation requires kneading dough, adding eggs, honey, brown sugar, and other ingredients. Next, the dough is rolled into a thin round cake, which tastes incredibly good when fried and crispy. When eating, it should be broken apart by hands. People used to share their food with friends and neighbors to strengthen relationships. Babao Covered Tea is an interesting tea loved by Hui people in Ningxia. The tea items include a tray, a bowl, and a cover. The tea is made from eight kinds of ingredients including rock sugar, red dates, walnuts, raisins, wolfberry and longan, and superior tea. It is not only sweet and delicious, but also has restorative effects. Especially after consuming mutton, the tea can freshen the breath and help with digestion.